Introducing our favorite programming blog’s android app! For the past few days, I have some spare time to code this. 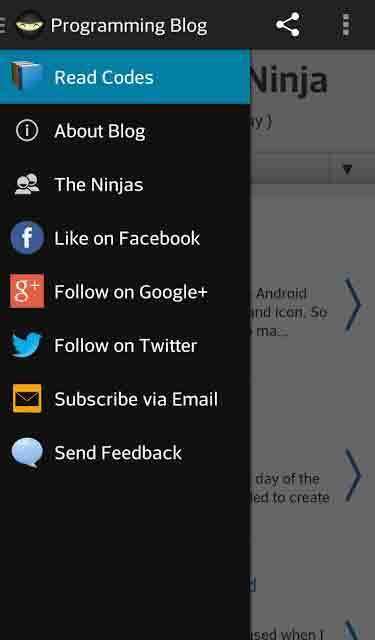 Now you guys can browse our blog instantly in your Android phone or tablet. To download this free app, go to your Google Play store and then search using the keywords “code blog by mike dalisay“, you can see our app on the search result. 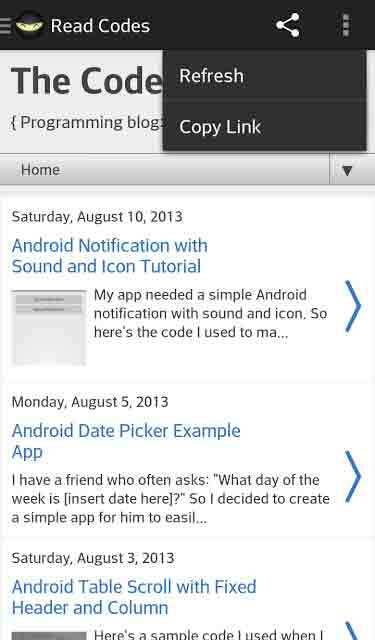 I think the first advantage of having a mobile website android app is, an app has to be installed. It means that your website or blog will have its own program and icon in the device home screen or list of apps. Users can put it anywhere they want. Our awesome readers can simply tap it to instantly visit your site and see some updates. The app (ninja) icon is in my home screen. 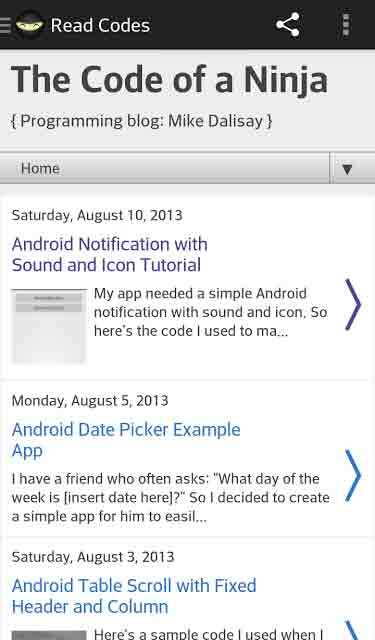 As for the features of this app, we’ll have screenshots with captions below, this can also be a user’s guide. The Blog View or the “Read Codes” section. Launching the app will bring you here. ninja icon on the upper left corner OR did a swipe from left to right. show you some info about the blog. 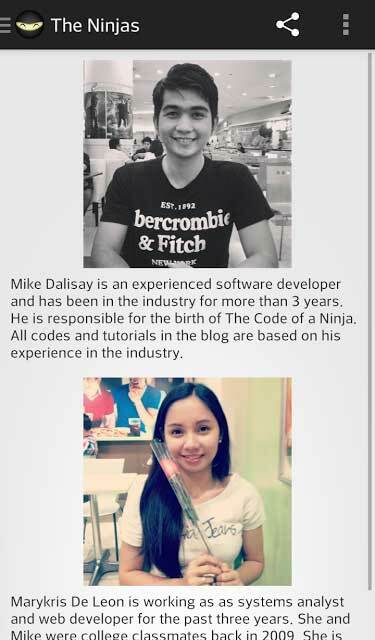 about the people behind our blog. what you are currently reading in the app. the URL of what you are currently reading. 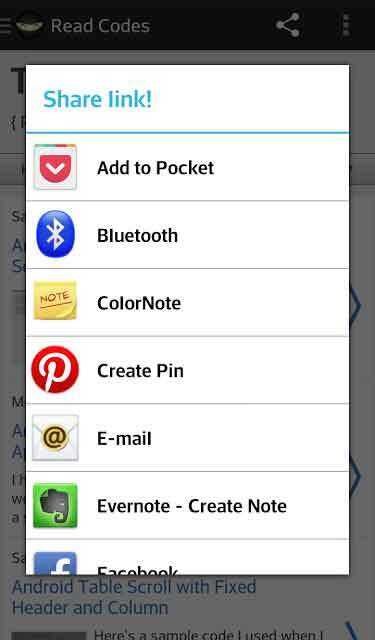 Now you might ask, what are the functions of those other icons in the navigation drawer? Like on Facebook – will open the Facebook app with our Facebook page loaded. Follow on Google+ – will open the Google+ app with our Google+ page. Follow on Twitter – opens the Twitter app with my twitter account. Subscribe via email – opens a browser with a feedburner form for email subscription. Send Feedback – will open the Gmail app pre-loaded with my email, subject and content. In the future, I want this app to have an offline feature, like the app is able to download useful tutorials or posts on the device so it can be viewed without internet connection. 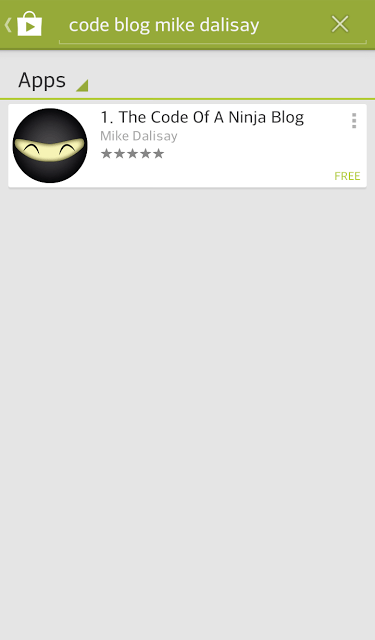 As of the moment, I only tested this app on my phone and 10.1 tablet (both Jelly Bean). I looks good and works fine for me. You might encounter performance issues, bugs or crashes, the usual things for a beta release. Please don’t hesitate to report them to me, the same if you have any comments or suggestion for our app’s improvement. Thanks! 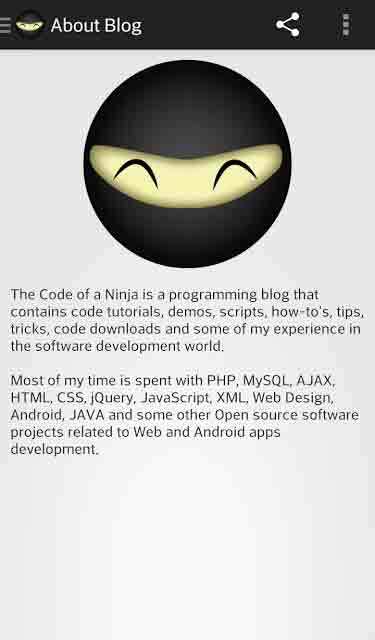 Thanks for reading this Introducing The Code Of A Ninja’s Android App (Beta)!